Chris Jordan has signed a Sussex contract extension ahead of the new season. The 2019 season will be the 30-year-old all-rounder’s seventh at the 1st Central County Ground. 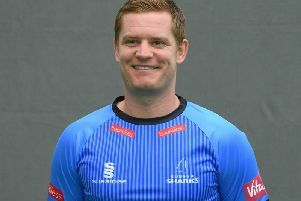 Since joining Sussex ahead of the 2013 campaign, he has taken 267 wickets and scored 2,410 runs in 119 matches for the club across all formats. After committing his future to Sussex, the England international - who has played 77 times for his country – said: “I’m very pleased. Ever since the minute I walked through the door here, everyone has always made me feel so welcome. It’s become home. “I think I have developed very well as a cricketer here and I couldn’t see a better place to continue my development. This is a great club with great people. Sussex head coach Jason Gillespie was equally pleased to have secured Jordan’s continued services: “It’s great to have CJ sign again with us. He has a brilliant work ethic when it comes to all aspects of his preparation for matches, coupled with his great skill. Assessing the mood among the squad ahead of the new season, Jordan – who was named player of the series for the IT20 leg of England’s recent tour to the Caribbean - added: “Everyone’s in a brilliant place. From all reports, it was a very successful pre-season tour to Cape Town. Everyone got what they needed to get out of it.